Mandala is a Sanskrit word meaning “circle”. As a spiritual and ritual symbol in Hinduism and Buddhism, it represents the universe. Through vivid colors and symmetric geometric patterns, it depicts the numerous facets of cosmos, its chaotic harmony. Mandalas’ eloquent symbolism illustrates both the qualities of the universe and the human spirit. 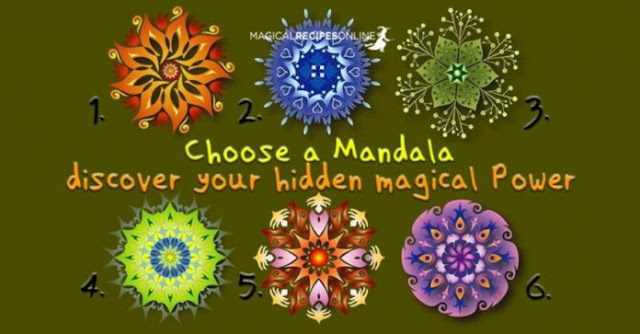 There are many interesting books about mandalas. In some editions, you can paint the patterns by yourself. This can be a very meditative action. We suggest this one:Mystical Mandala Coloring Book by Alberta Hutchinson, although there are several similar works to obtain. Is our predilection for one mandala over another revealing about our inner self?And how! In the test we are presenting to you today, you can select one of the mandalas out of the ones in the photo above. Your choice will reveal which power determines you and how you could make use of it for good intentions.